Suunto has recently released the Spartan Sport Wrist HR Baro to the Spartan line up, filling a much needed gap in the Spartan line, providing a watch that has both wrist HR AND Barometer. Prior to the release of the Spartan Sport Wrist HR Baro, Spartan Ultra models were equipped with Baro and select Spartan Sport models were equipped with wrist HR, so combining the two is the next logical step. The Spartan Sport Wrist HR Baro comes in 2 flavors, Stealth (above) and Amber (below), which have slightly different bezels and a slightly different textured silicone wrist band. Retail price is $549, or $599 if you add the chest HR strap. Initial Impressions: The Baro (I’ll need a nickname here to simplify) looks and feels like the premium, high end watch that it is. It is on the larger and heavier side for GPS watches, but at 74 grams (78 by my unofficial scale), it feels surprisingly lighter than my 87 gram Suunto Ambit3 Peak that I have been solely using over the past 2 years. Spartan Baro left, Ambit3 Peak right. Overall diameter/circumference is the same, but the Spartan Baro has much more usable screen space. Both watches look amazing, the Amber is super cool, in a flashy sort of way that screams athletic outdoor use. The Stealth, as the name implies, is just as much at home at a business meeting, fancy restaurant or other formal events as it is in a mountain race. I could easily flip a coin on which one is better looking, but I do appreciate the all-around versatility of the Stealth. Keep in mind that the bezels vary slightly, where the bezel on the Amber version is much smoother that the Stealth, which has somewhat sharp edges that can be annoying at times under clothing, catching on things or a bit scratchy under bed sheets (if wearing for 24/7 tracking). 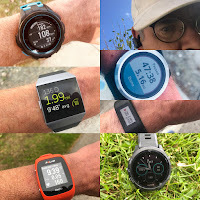 Overall comfort is far superior to any other GPS watch I have owned in the past (previous GPS watches include the Garmin 305, Garmin 910XT, Suunto Ambit3 Sport, Suunto Ambit3 Peak), as it does not have the GPS antenna bump that is the norm on the Ambit line. Additionally, the Baro is thinner than the Ambit and has a “normal” watch band that pivots at just the right spot as to not feel rigid or stiff. The band on my Ambit is somewhat plastic-y and stiff, where the silicone band on the Baro is soft, comfortable and compliant with just enough stretchy give to it. Though the weight of the Baro is just marginally lighter than the Ambit, it's better fit and lower profile allows it to go nearly unnoticed while running, where I am often aware of the bulk and density of my Ambit. Touchscreen: The mineral crystal color touch screen on the Baro is vibrant and easy to read in most conditions. The screen brightness is adjustable on a 0-100% scale, but I stuck with the default 50% setting, which seems to be sufficient, as does the auto setting that darkens/brightens the screen as necessary depending on the lighting conditions. I was initially somewhat skeptical of the need and use of a touch screen on a GPS sport watch, but have quickly come to appreciate it. It is responsive, intuitive and easy to use. 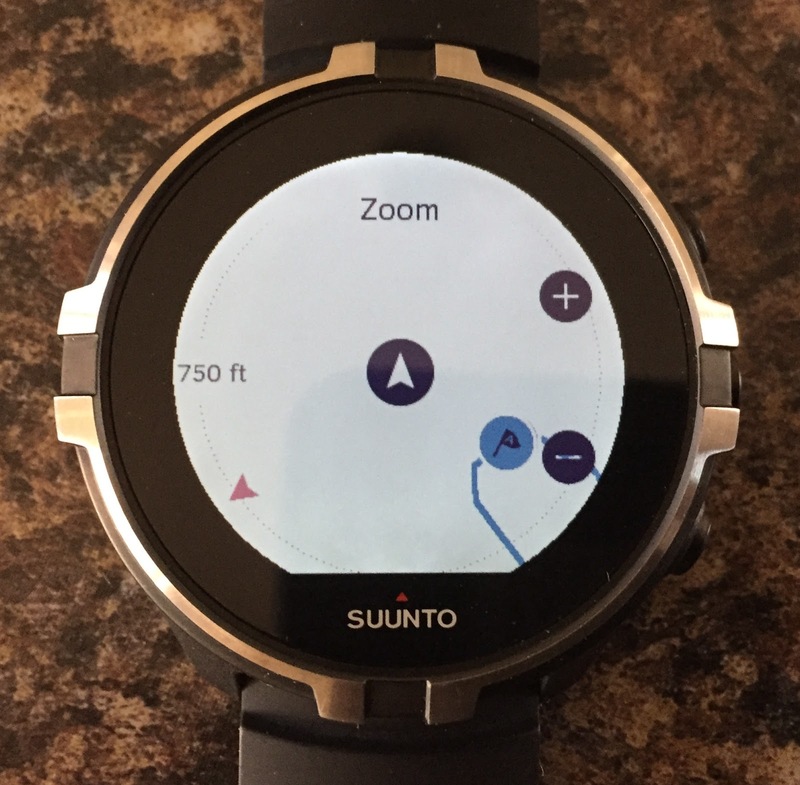 When recording an activity (or “Move” in Suunto Movescount parlance), I find that I do not really ever need to touch the screen, unless I want to more easily toggle through navigation settings. If you prefer, you can also do just about all that you need to do, whether in an exercise recording mode, or in day to day use with just the buttons and can even disable the touchscreen if you would like during an activity. Though the touch screen works very well in most conditions, it is a bit finicky when wet and quite slow to respond, requiring multiple attempts. Additionally, when wet, I found that the screen lights up constantly for some reason, but again, if this were a consistent issue, you can adjust these settings and get around no problem with just the buttons. In most cases, once I begin an activity (or Move), I lock my watch so I do not mistakenly futz a button and stop recording by mistake. With the Baro, this also disables the touch function, which I guess is OK, but frustratingly also prevents access to scrolling through my various data fields on separate screens. In order to see another screen or my navigation functions, I have to unlock first. A minor gripe, but this is a step backward from the Ambit, where I can scroll all screens in lock mode (though I do have to unlock the Ambit to access navigation, while being careful not to stop my activity). Durability seems to be excellent, as I have dinged the watch several times, but have not yet had a scratch or nick to either the screen or the bezel. I do find that when I am using the touchscreen, it is very prone to collecting smudges and fingerprints, which I find somewhat distracting and obscuring depending on the view angle and lighting conditions. Maybe I am just a bit picky, but this bugs me and I am often cleaning my watch screen throughout the day with a glasses cleaning cloth. 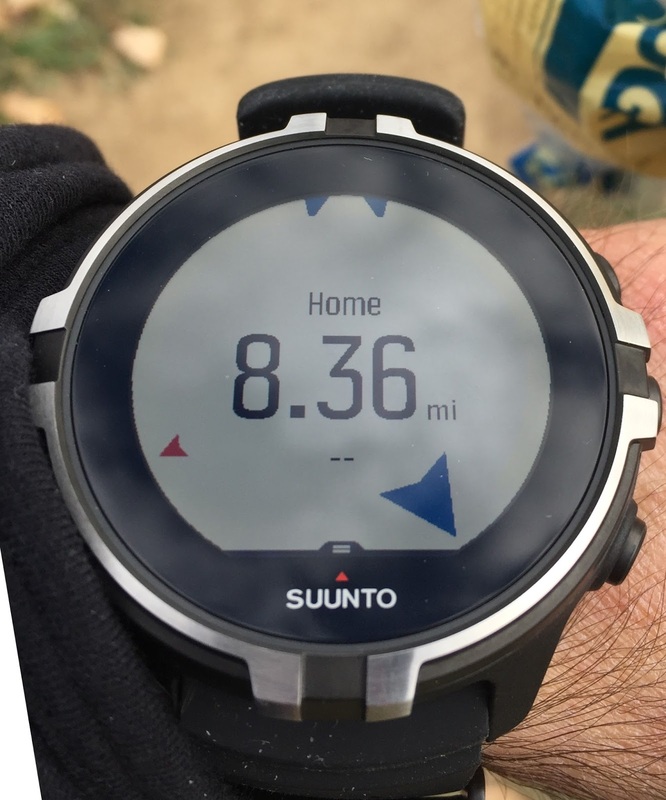 Setup/software/functionality: Setup is a snap, especially if you are familiar with Suunto, but setting all of your personal information, adjusting settings and syncing with Movescount on PC and the App. (iOS for me) was easy (adding to my already existing Movescount). The menus are very easy to cycle through and logically arranged. GPS Accuracy: GPS accuracy is very good and for the most part, closely mimics that of my Ambit3 Peak which I have also been using along side the Spartan Baro for every run. I have always found the Ambit to be quite accurate, most always within a few feet of my actual footsteps on the ground, though no GPS that I have used is completely immune to the occasional flub, either in canyons, heavy tree cover, or the odd inexplicable moment where satellite alignment might be less than ideal. Though the Spartan Baro tracks quite well, I do notice that it has a tendency to wander off of my true life path, where the Ambit track is more representative of my actual path. This is most easy to pick out when running in a more urban setting, where I know I am following more defined linear features, such as a sidewalk or bike path. In the 3 photos below, green represents the Spartan Baro track, where red represents the track of the Ambit. You can see that the Ambit catches these switchbacks a bit better. I stuck precisely to the bike path, with the red line of the Ambit shows much more accurately. Here, the red line of the Ambit is spot on with my path, where the Spartan Baro makes it look as though I am cutting through yards. Both the Spartan Baro and the Ambit hiccup in sync with underpasses, making smoothly in one direction, but straying in the opposite direction. Extreme moments of bouncing signal however are infrequent, but when they do happen, they seem to happen more often for me on this particular route on 8,461 foot Bear Peak in Boulder. The trail starts off in sparse trees, but then climbs into Fern Canyon, which is deep, in dense tree cover and surrounded by towering rock formations. Here is a better zoom of Fern Canyon and up onto the upper ridge, where this segment covers nearly 2,000 feet of elevation in about a mile. The Ambit is the red line and the Spartan Baro the green, you can see they parallel one another closely (this was an out and back run). On this occasion however, same route, different day, the Spartan Baro (green) went for a bit of a walkabout, tracking way off on the upper mountain especially and showing that I wandered off the other side of the summit in cliffy terrain (which was definitely not the case). This was the only real anomaly in all of my time using the Spartan Baro and since my Ambit3 Peak, Sport and previous Garmins have all done this on multiple occasions, I'll chalk it off as a normal hiccup. The Spartan Baro also includes GLONASS, which is the Russian version of GPS navigational satellites and can be easily toggled on or off at will when beginning an activity. Suunto claims that using GLONASS is advantageous when running in cities with tall buildings, so to replicate, I tried the GLONASS out in and among the Flatirons above Boulder, rock formations that at their tallest, are comparable to the Empire State Building. The Spartan Baro measured 2/10 of a mile more than the Ambit, but is inconclusive as to which is the more correct reading. I suspect that it was perhaps the Ambit that was coming up a bit short considering the terrain. Also, to simultaneously test the battery life as it relates to "OK" tracking accuracy, I ran a loop on Green Mountain with my Trail Running mode adjusted to OK. Red is the Ambit3 Peak on best tracking rate (reading every 1 second) and the green track represents the Spartan Baro on the most battery efficient setting "OK" (reading once per minute). The difference between the two is remarkable, with the Ambit set to best measuring a consistent, well established 4.64 miles, vs. the Spartan in OK mode measuring a very low 3.71 miles. Of course this is no reflection on the Spartan, just an interesting comparison of setting dependent accuracy. Power savings when using OK GPS accuracy setting is remarkable, sipping a mere 7 percent of battery life on a 1:15 run vs. what would normally be closer to 15% of the battery life. If on a long backpacking trip, or outing where accuracy is not particularly important, the OK tracking mode may be sufficient, but I'll definitely stick with the best tracking setting and recharge frequently. For the sake of comparison, I also tried "Good" mode, which does save battery and is much more accurate than "OK", but still lags in accuracy behind "Best", as would be expected. For hiking, I think "Good" is a sufficient compromise. In the two photos below, the green track is the Spartan Baro in the medium "Good" mode and the red track belongs to the Ambit in "Best" mode. You can see that the Spartan Baro is shortcutting, resulting in an overall shorter distance of 4.59 miles vs. the much more accurate 4.95 miles. Again, this is not a knock on the Spartan Baro, just a simple comparison between accuracy settings. Wrist HR Accuracy: Suunto uses a Valencell Wrist HR sensor with pulsating green/yellow lights to detect your HR. I have found the wrist heart rate to be accurate for 24/7 tracking and sleep tracking, but struggles when running. While running, I consistently have the watch tightened enough to prevent any chance of bouncing, have tried my normal left wrist and my dominant right wrist, worn normally and up high as recommended by Suunto, but no matter what I do, wrist HR readings vary wildly from my much more accurate Ambit with Smart Sensor chest strap readings. On occasion, I will observe similar readings between the wrist HR and the Ambit3 Peak chest HR, for short periods of time, inspiring hope and confidence, but invariably, the Wrist HR of the Spartan Baro will stray. On long sustained climbs, the wrist HR will read on average, 30 beats below actual HR, with occasional random spikes or drops (I have seen it jump to over 200 bpm during a moderate effort) and on long downhills, the wrist HR will read on average, 30-40 bpm above actual HR. Both Sam and I strongly suspect that the wrist HR algorithm is confusing HR with Cadence and causing these erroneous readings. At the end of the run, overall average HR will usually be within 4 or 5 bpm of the Ambit with strap, but there is a lot of variation in between. The readings below are pretty typical of my usual mountain runs, where the Ambit with chest strap aligns very closely with true HR and the Spartan Baro is just going crazy with no real rhyme or reason. The below charts are very usual representations of my HR readings on all of my mountain runs, purple being the Ambit3 Peak with strap and blue being the Spartan Baro. On flatter runs, the Wrist HR tracks more closely in line with the Ambit with strap, not as large of a discrepancy, but worthy of note. Seeing this sort of Wrist HR inaccuracy could very well be an issue for many, especially those looking forward to more accurate readings for serious training and tracking and who no longer want to wear a chest strap. Both Sam, RoadTrailRun editor, and I have thin wrists and often run in cold conditions. We both saw similar inaccuracies with the Baro and for Sam who has tested just about all, if not all, recent wrist based optical heart rate units, and often runs flatter terrain than I do, the inaccuracies were more frequent and persistent than with other comparable units for Sam. 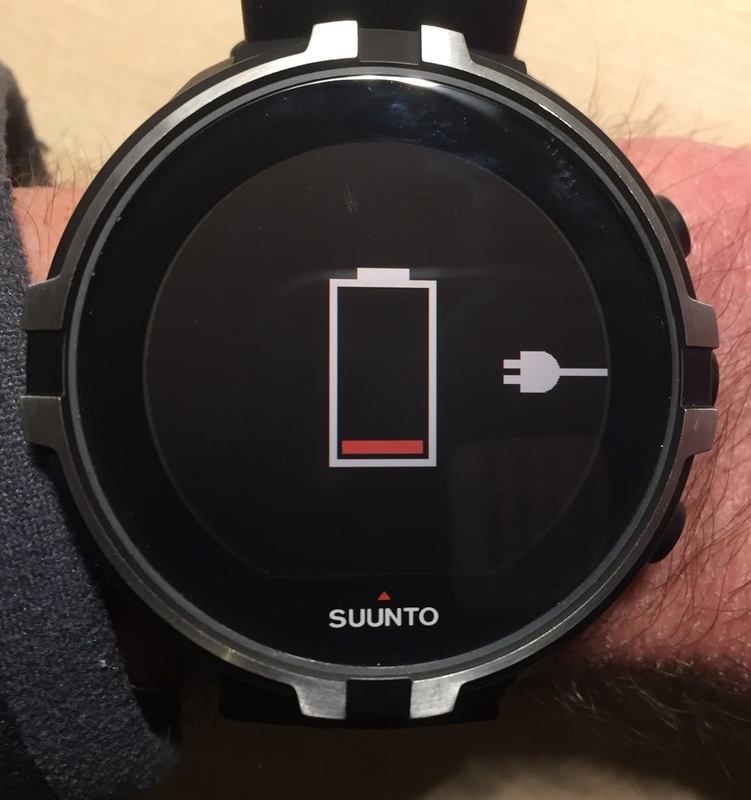 During a phone call with Suunto, Sam heard that by and large their support calls do not indicate significant issues with the wrist heart rate. They also told Sam they are working hard with their partner Valancell to increase accuracy for all users. These comments apply to all wrist heart rate monitors. With any wrist heart rate monitor smaller wrist sizes, how the watch case fits one your wrist, poor blood flow especially in cold weather, clenching of hands, vibrations such as those on bike rides, and accentuated arm movements such as when running steep downhills can affect accuracy. High spikes tend to occur earlier in runs when blood flow is lower as shown on the last graph above and are largely caused by the units confusing cadence for heart rate. It is useful to be well warmed up before starting runs to get better accuracy. The watch should be on your dominant wrist and not on the customary left wrist for a watch if you are right handed. Wear it a bit higher than a normal watch to avoid the wrist bones and have it snug so no light sneaks under as light can interrupt the signal. Altitude Accuracy: The Barometric Altitude with FusedAltiTM works very well and has proven to be very accurate on most of my runs. When auto calibrated at a trailhead, or programmed in with a known altitude, it tracks exceptionally well and is generally within 10-50 feet of true elevation. Again, when compared side by side with the Ambit3 Peak, they are within 10-20 feet of one another. Changes in weather and pressure can occasionally throw off my readings by 100 feet or more, but I rarely worry about it unless I know I will be following routes where I will need to make elevation based navigational decisions and I'll be sure to calibrate ahead of time from a known elevation (crosschecking with my Gaia app.). Ambit3 Peak top, Spartan Baro bottom. True summit of Bear Peak is 8,461, so very close for both. While visiting the National Center of Atmospheric Research (NCAR) here in Boulder, a local company who specializes in sophisticated weather stations, sensors and radar products happened to have a display set up in conjunction with the Super Science Saturday for kids. Of course I was eager to show off the Spartan Baro to them and compare readings with their high end equipment. Elevation and barometric pressure and trend matched up impressively well. 24/7 Tracking: 24/7 tracking is new to me and I found it interesting to track my day to day steps, heart rate, calories burnt, hours of sleep and average HR during sleep. It is somewhat difficult to accurately cross check these numbers, but steps seems about right, at least compared to my Ambit3 Peak and what I was seeing when I tried my wife’s Fitbit Charge 2. Sleep tracking is generally accurate most nights, but one night missed the time at which I fell asleep by 2 hours and another night, claimed I only got 2:50 of sleep when in fact I got 8:30. Aside from these 2 flubs, it has been pretty impressively exact on the other nights. This tracking appears on the watch to show a 7 day trend, but there is no way to dig into specifics for each day or night, nor does it record over time. If I wake up and do not look at my sleep stats right away, I will miss them and they are just gone forever with no way to retrieve, either in the watch or in the app or PC Movescount software. The same holds true if I fumble a button in my pre-coffee stupor, just pfft… and sleep stats are gone never to be seen again. 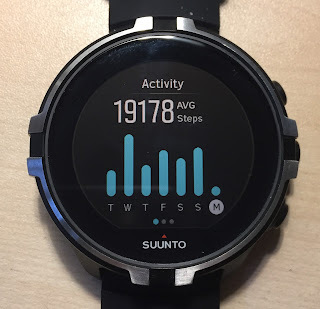 I would personally like to dig into these stats a little deeper and I know that other competing manufacturers have more robust tracking metrics and capabilities in both the watch and the app.. Suunto has recently worked to improve upon this with their recent Oct. 17th software update, but it still has a ways to go in the activity tracking arena. Battery Life/Charging: Suunto claims 10 hours of continuous highest quality tracking with wrist HR on which tell us is in consistent lab conditions with a strong GPS signal. I was able to only eek out 8 hours and 4 min, with an additional 2 hours of just normal watch mode with no real usage, aside from the 24/7 tracking mode being toggled to on. With power saving functions activated (lesser quality GPS tracking, wrist HR off, lowered screen backlight), you can eek out longer battery life, but at the expense of accuracy. For general day to day use, with 24/7 wrist HR tracking, 50% screen brightness, a 3 or 4 hour run using best GPS tracking rate, I can easily chug through 60+% of the battery by dinnertime. Even if I do nothing all day, I’ll use up 30% or more, but I confess to playing with the watch a lot since it is new and I am reviewing. For most people, most days, battery life is sufficient as long as you are diligent about charging every day or 3 depending on how much you use GPS mode and which accuracy setting you use. As I do not run for 10+ hours all that often any more, it works for me, but those who participate in longer outings and ultra distance events may want to consider the Spartan Ultra with double the battery life. Another option to extending usage time if on the move is to bring along the charging cord and a supplemental battery pack. I have found that this works quite well, as the watch is still comfortable with the charging cable attached, though time to full charge during use seems to be a bit slower than when connected to the computer or wall charger. The 4 pin charging connection is magnetic and attaches securely. Connected to my ANKER 3350 mAh battery pack. With charger attached, it is comfortable and only slightly awkward, wrist HR will be compromised however. I noticed that when I deliberately ran the battery out, there were no warnings as to how low it was getting and if not closely monitoring, could come as a surprise. Once the battery died, I put it immediately on the charger and it charged fully in less than 2 hours, but it was having trouble syncing with both the mobile app. and Movescount on PC. Additionally, almost as a form of punishment for not paying closer attention to your battery level, the watch gets stuck in a sync mode for some time, not allowing access to GPS functions, Logbook, Settings, etc... I connected and re-connected multiple times with the charge/connection cord and also with the mobile app. and eventually it snapped back to normalcy, but I am not sure if it was my efforts or just coincidence. Navigation: Navigation features have been improved over the Ambit3 Peak, as they are easier to access on screen, have colors and symbols which make it much easier to read than the Ambit. Adding routes and waypoints via Movescount is also a snap. I often use the breadcrumb feature to backtrack a route which is very handy, especially in bad weather above treeline, thick woods and complicated terrain. My only complaint here however is that maximum zoom is 150 feet/45 meters. This works well for general use on trails, roads and wide open areas, but still leaves me guessing at times in steep, cliffy difficult terrain where precision makes a big difference. Zoom is accessed by pressing the center button for a bit more than a second when on the navigation screen. You then see + and - , where you can use + to zoom in, - to zoom out. Increments are 150ft/300ft/750ft/1,500ft/3,000ft/1 mile/2 mile/5 mile/10 mile/20 mile/50 mile/100 mile/200 mile and 500 mile (in case you are really lost). You can navigate using the direction arrow to waypoints, such as home in this example, but does not take into account anything other than direction. In the photo below, I am aiming in the wrong direction, as I would line the blue arrow up with the blue frame at the top. The red arrow is North (can be adjusted to true North or Magnetic North). To create routes or waypoints, select your watch. Below are two routes I created, which from here I can see the list, toggle them on/off in my watch, delete or edit. Nebel route, which I did use to find my way. Local test route, which worked perfect. When first trying to create a route that was off the beaten path, I could only make my route on established roads or paths, but figured out that at the bottom of the screen there is a drop list (bottom far left of center) where I had to toggle from "follow roads walking" to "do not follow roads". These navigation features are excellent and can guide you through most scenarios, but it takes a little planning ahead and is also really helpful to couple with a mobile GPS mapping app such a Gaia for detailed topo maps, overviews and more precise pinpoint of location spatially. 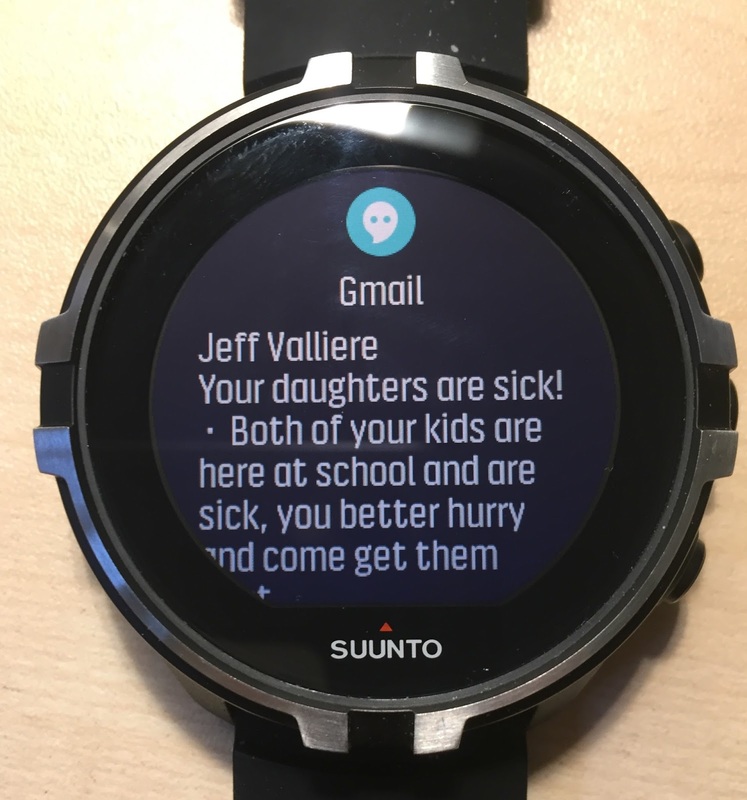 Smart features/Notifications: Functions and features as a smartwatch are limited, but I really like having text, email, calendar and phone notifications accessible on the watch. The amount of text you can read has increased, more than enough to get the gist of the message and gauge its importance. This is key for me as I often need to be reachable when running, yet will only stop to dig out my phone if of the utmost importance. Though the amount of a message you can read has expanded, the Baro has regressed a bit from the Ambit in that any message you receive, you must read immediately, because once it disappears from the screen, it is gone for good, whereas the Ambit, you can go to the Notifications menu and access archived messages. Alarms/alerts/sounds: Sounds and vibration settings are basic, but sufficient. You can opt between sounds/vibrations for buttons/alerts, both or either. I prefer vibrations only for alerts and no button noise or vibration. This is super handy when synced with your phone to be alerted without bugging others around you. App. functionality and syncing: The Movescount app. is solid and reliable and stays synced with my watch almost all of the time to receive notifications, but does not stay synced for some reason in regard to transferring Moves or updating settings and a new connection needs to be established each time you want to upload activities to the app. After completing an activity, I’ll begin the sync process to upload my Move to Movescount which then transfers it over to Strava, yet can easily take 5-15 minutes, which can seem tedious at times. Within the Movescount app, you can access previous Moves and most of the data, maps and graphs, some recent 24/7 activity (but does not record and is not very comprehensive) and provides the ability to adjust and refine watch settings as well as activity settings. The visible fields during an activity are customizable and can be adjusted within the mobile app. or on the computer. You just need to remember to sync up after doing so. Making adjustments to the sport settings is a snap with a little practice. In the PC version of Movescount, simply click on your user icon in the upper right for the drop down, select my watches and you will see the page below. Select your watch. You can choose from a zillion different sport modes and toggle them accordingly depending if you want them to show on your watch menu or not. No matter the sequence of sport modes shown below, the one you use most often will default to the top in the Exercise watch menu. You can select from several pre-programmed modes within each sport mode, but one of my favorite features is the deep customization of the data fields. Below are my main two trail running modes, the top if I am not utilizing wrist HR and the bottom to choose from if I want to use wrist HR (or chest HR). Since there is no way to toggle wrist HR on/off within the watch that I could find, this was an easy work around. You can choose the amount of fields you will view on each screen, anywhere from 3-7. Be sure to click on the rotating arrows to access the options for your displays (this icon is not particularly obvious or intuitive). Here you can choose. For trail running, I prefer less fields and larger display numbers, as it is easier to see and interpret when on technical terrain. For road running, I can handle 5 or 7 fields, as there is less to trip over. The type of data you can select from for each field is quite diverse, enough options to keep just about anyone from any sport well informed. Pairing with Suunto Smart Sensor: The Spartan Baro easily paired with my Suunto Smart Sensor chest strap, providing very accurate HR readings during activities. Given the limitations of the Wrist HR, even though I have to add a chest strap (which I don't care for), I still prefer it, if only for the sake of accuracy. Wristband removal and Replacement: Removing or replacing the band, if need be, is very simple and can be removed in seconds by sliding a small metal lever that releases the pin, which is much easier than my Ambit, where one would need to find a micro size torx bit. Currently the only available band options are the black and amber silicone bands that come standard on the two available units. Given the ease of changing, it would be nice to see some variations here, but I am sure that will come in time. The Spartan Sport Wrist HR Baro is a very high quality GPS watch with a deep array of features and functionality that will be sure to please many athletes through a wide variety of sports and interests. GPS accuracy is, for the most part very good, as is elevation accuracy and 24/7 tracking. It is very comfortable, looks great and is durable. The ability to customize data fields is a huge plus for me, as are the notifications and vibrating alerts. The inaccuracy of the Wrist HR for me is a real detriment to an otherwise very good watch. I could see it not being a problem for the very casual user, but I would guess that anyone plunking down $550 for a quality GPS watch are going to be more serious athletes that expect a much higher level of wrist HR accuracy. Battery life will almost certainly be an issue for those who participate in ultra distance events, Ironman triathlons, long days mountaineering and the like, where you will be out for 8+ hours. You can charge on the go, but I personally would prefer a watch that could last 20+ hours on the most accurate settings, even if it meant a few more grams of weight on the watch. Most of my other little nitpicks, like 24/7 tracking metrics, access to messages and scrolling screens/fields while locked could all be easily fixed with future software upgrades, which I suspect will happen. Hopefully wrist HR accuracy can also be fixed through software tweaks. If maximal battery life and accurate Wrist HR is less important, the Spartan Sport Wrist HR Baro makes for a fine everyday watch that can accurately track just about any sport or outdoor activity. Suunto Spartan Sport Wrist HR Baro vs. Suunto Ambit3 Peak - Both track close as far as GPS and elevation accuracy, but would certainly give the edge to the Ambit3 Peak on both. The wrist HR is a minimal factor because the Ambit does not have wrist HR and the Spartan Baro's wrist HR does not work well during exercise, but a Smart Sensor strap can be paired with either for very accurate heart rate tracking. However, for 24/7 tracking, the Spartan Baro certainly does that reasonably well. Comfort of the Spartan Baro and it's lighter weight is a nice reprieve from the comparatively unforgiving hardness of the Ambit with the satellite antenna bump, but it is really only significant to me when I wear them side by side, as I have a particularly thin and bony wrist. The Spartan Baro has some nice perks, such as the color touch screen, a variety of watch faces, much better notifications, more configurable data fields, 24/7 tracking features and really looks classy for day to day wear at the office or an evening out. The price however is battery life, where the Spartan Baro is less than half of the Ambit. For that, I appreciate the power sipping nature and larger battery of the Ambit, as I can travel for a week, run every day and not have to bring the charging cable and I hardly ever think about it at home, just occasionally charging to top off. 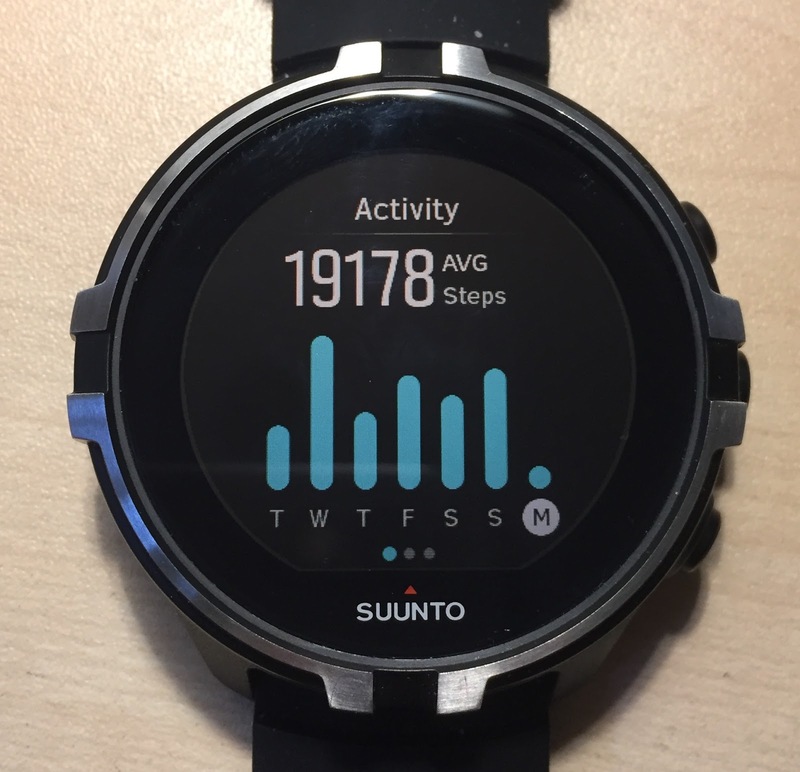 Additionally, the Ambit3 Peak is priced $150 less than the Baro on the Suunto website and can even be found for less if you shop around. The Baro was provided at no cost.The opinions herein are entirely the author's. 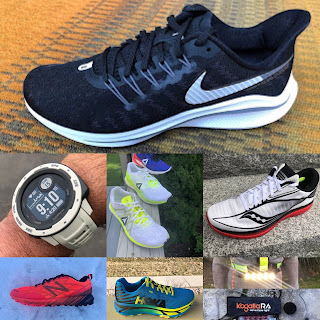 Hi Jeff,would you compare Suunto Spartan Sport Wrist HR Baro and Garmin Fenix 5 ?? Hi Ivan, I have not yet used a Fenix 5, so anything I could say would be educated speculation, but Sam has used both, so could perhaps chime in. We are planning an upcoming detailed comparison between the Fenix 5X and the Spartan Baro soon, so stay tuned! Thanks for reading, Jeff.